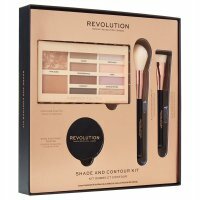 SHADE AND CONTOUR KIT by MAKEUP REVOLUTION. Make-up kit. 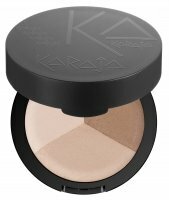 In a quick and easy way will help in contouring, lighting and embossing the face. 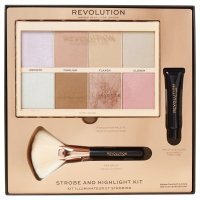 It contains a palette of 10 pressed powders (4 highlighters, 4 contouring shades and 2 bronzers), baked face powder and 2 brushes made of synthetic, soft bristles. Colors composition mean that every woman will find the perfect shade and thanks to the finishing powder, the makeup will stay on for a long time, without shining. The whole has been placed in an elegant package, thanks to which the set is perfect as a gift. 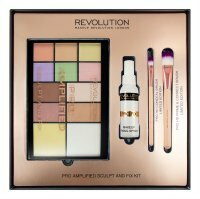 It contains a contouring palette, powder and 2 brushes. 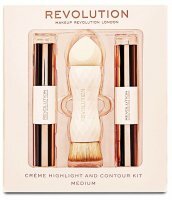 Provides an easy contouring and makeup finish.